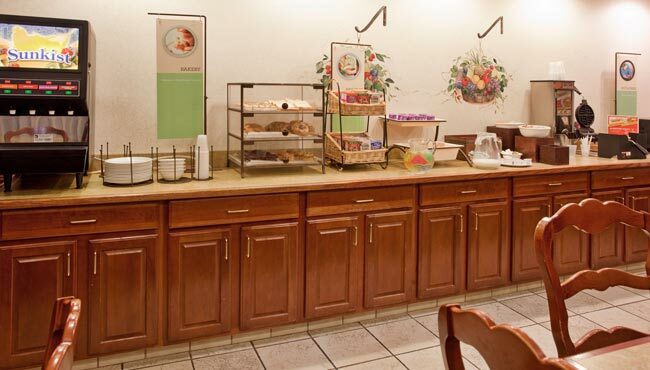 Dive into a Belgian waffle or a steaming bowl of oatmeal at our complimentary, hot breakfast. You can also browse the selection of cereals or build a healthy meal of yogurt and fruit. If you’re in a hurry, choose a quick option like a muffin, a Danish or a bagel with cream cheese. For lunch or dinner, choose from an array of nearby restaurants, including Emily’s Restaurant & Tapas Bar, where you can try exquisitely crafted small plates, or Buffalo Wild Wings, where you can fill up with hearty bar-style food.